New York, NY: Alfred A. Knopf, 1969. Stated First Edition. Text/BRAND NEW & Bright. Illustrated black linen boards/Fine. DJ/NF; price-clipped w/light edge wear. Light spotting (acidic paper reaction) to upper text edge. At the point of publication, Ray Ovington (1917-), known to anglers as the MC of the radio, and later television, show "The Rod & Gun Club Club of the Air" and his columns in the New York World-Telegram & Sun, was the head of the Natural Resources Group of the Univ of California at Irvine. This reference/resource, illustrated by Ovington, is well described by its lengthy sub-title: This unqiuely concrete book teaches the angler how to "read" trout water and, with the help of numerous precise procedural drawings, explains exactly how to wade, cast, and fish out each of 33 different, but typical, kinds of trout pools". Fine copy.. First Edition, First Thus. Hard Cover. Near Fine/Near Fine. Illus. by Ray Ovington (Author-Illustrator). San Francisco, CA: Chronicle Books, 1971. Text/BRAND NEW. Illustrated soft cover/NF. Guide to fishing at Shasta Lake, Califorinai, which is one of the best places for bass, trout, bluegills, crappie and catfish. Five separate maps cover every mile of shoreline, and four maps to the arms of the Lake formed by feeder streams. Jim Freeman is The Woodsman columnist for the San Francisco Chronicle.. First Edition, First Thus. Soft Cover. Near Fine/None as Issued. Minneapolis, MI: North American Fishing Club, 1991. BRAND NEW Copy. DJ/None (as issued?). Illustrated gilt embossed boards. North American Fishing Club logo to endpapers. Reference/guide. 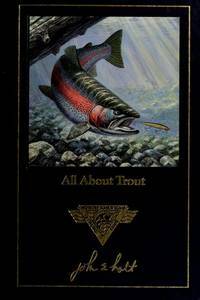 26 chapters presented in 5 parts: Part I, Understanding Trout; II, Finding Trout; III, Tackle for Trout; IV, Streams; and, V, Lakes & Reservoirs.. First Edition, 6th Printing. Hard Cover. Fine/None (As Issued? ).